I visited the Mission, San Francisco’s oldest settlement on my third visit to San Francisco. Rookie mistake. 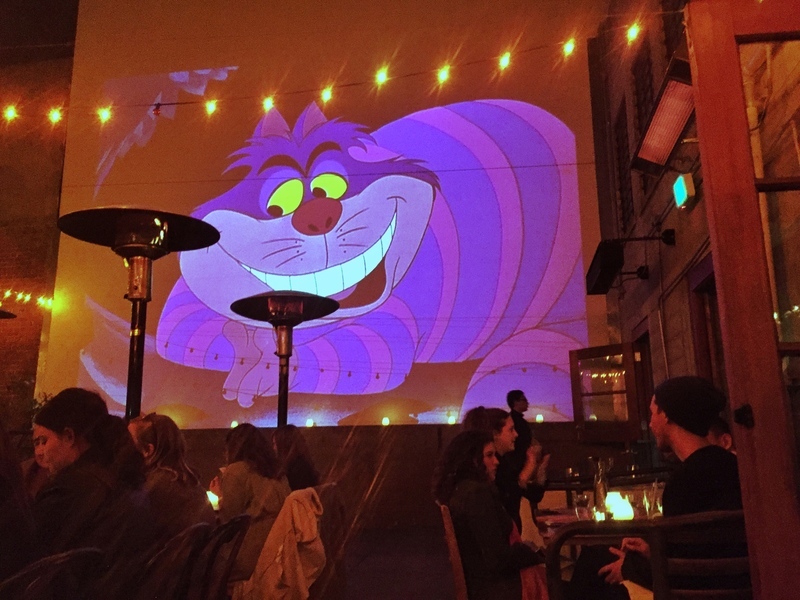 If you’re in San Francisco for at least 48 hours on your first trip, don’t be a rookie like me and go have fun with these five things to do in the Mission District. Oh, and eat tacos while your there. Apparently, they’ve got some of the best tacos ever. I will next time. Such a rookie right. These five activities aren’t anything groundbreaking, but with a smidgen of planning you can do them all in one afternoon and evening. After reading about the activities below I suggest an itinerary that’ll make the best use of your time as well as letting you in on the one reason you need to visit the Mission above all else. I could have spent a whole day here. 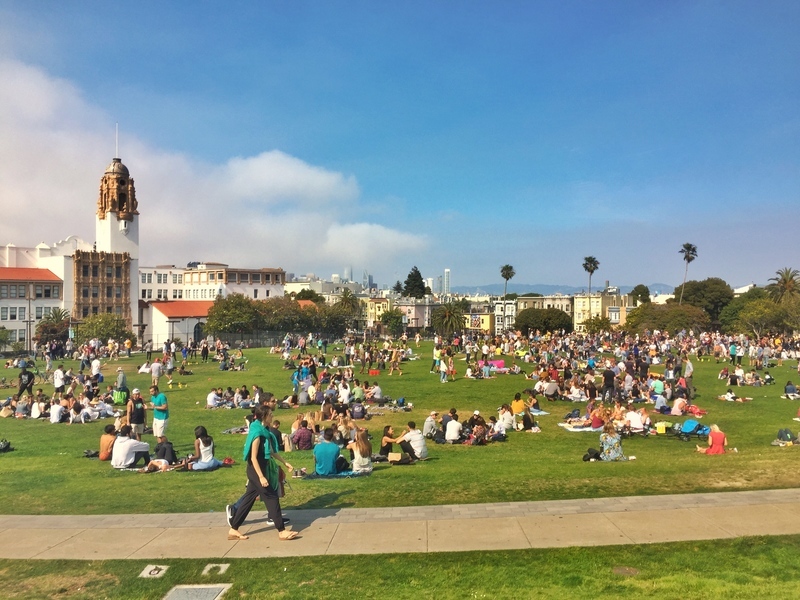 My friend suggested we go hang out in Dolores Park, saying it was a popular place to go most afternoons. I always enjoy hanging out in parks in every city but never imagined anything like this. Over 7,000 people can visit the 16 acre park some days! 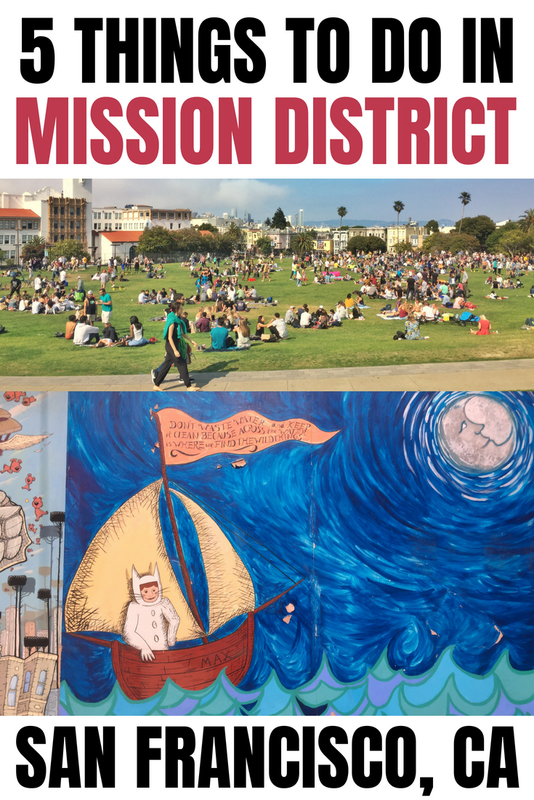 Officially called Mission Dolores Park, there are the usual suspects you see at a park (playground, basketball court etc. ), but the people watching is where it’s at. With over 7,000 people you could potentially set your eyes on in a day, there are all sorts of people hanging out. Some are playing games, some throwing frisbees, some chatting, others celebrating, a few creating. And you can forget entrepreneurial folk coming by from time to time offering massages, drinks, food, you name it. There was a Leave No Trace campaign implemented and the regulars have followed this (helped by people making an extra back by collecting the recyclables) so the park is tidy, meaning if you do decide to bring a beer or three, no one is going to take them off you if you’re responsible and clean up after yourself! Bring a picnic along and spend an hour, preferably two relaxing with the locals. You might even see a group of furries! I didn’t believe this at the time, but there’s a dedicated fury culture in the Bay-Area. I feel quite privileged to have seen them at Dolores. 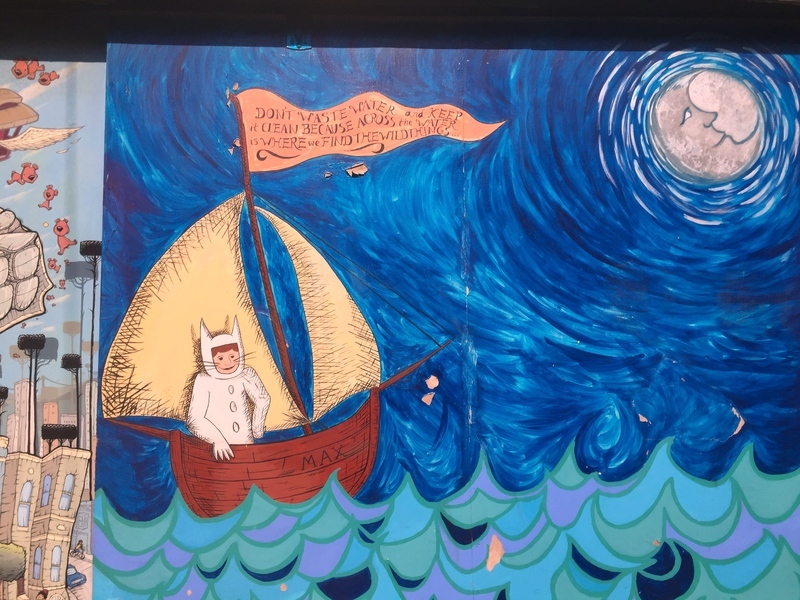 It’s tough to say what the Mission District is most famous for, but the murals are definitely one. Balmy Alley is the most well-known spot to see some of the street artists best work. From what I gather, the pieces are regularly changing which keeps people back time and time again. It’s not too far off Mission Street, maybe not worth coming out to the Mission just to see the alley, but definitely take a walk to check it out while you’re in the area. 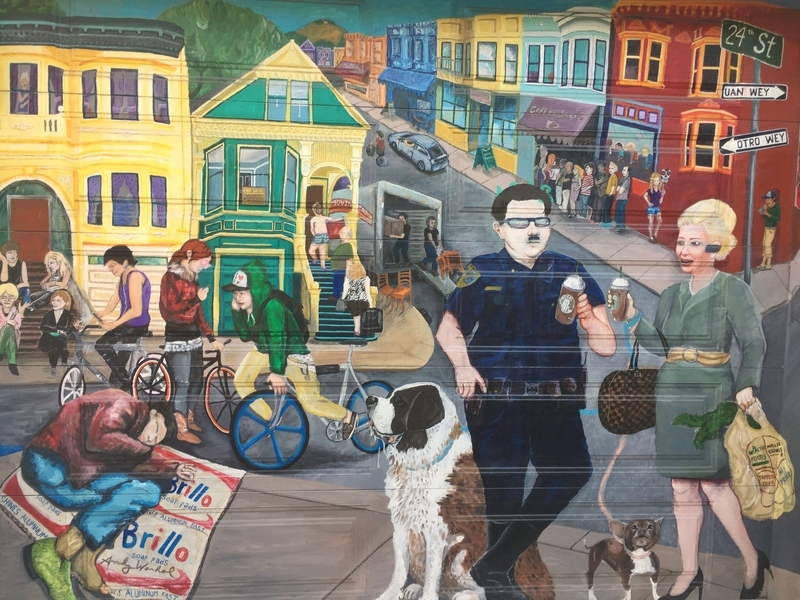 If you take a close look at this piece, you’ll see it captures a lot of the contrasting aspects of SF, a common thread in many of the murals. Whether you’re a golfer or not, mini putt (a.k.a putt-putt) is always a great time with friends and family. Southeast Asia isn’t the best for mini golf, so I was stoked as to see there was a totally San Francisco-esque looking course when researching Mission activities. What makes it a San Francisco gem? 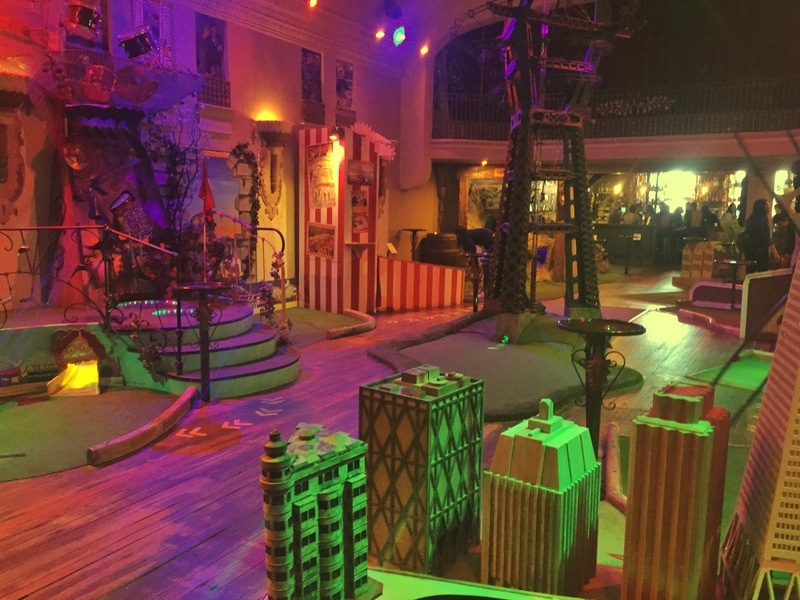 It’s an indoor mini-putt course…with a bar! On the first day I was there on a Sunday afternoon and it was packed. The mini-putt first come first serve so if you’re coming here on the weekend expect a slow and frustrating time on the course. No thanks to the bar right next door of course (but that’s what makes it awesome at the same time). I returned on a Monday the following week arriving around 5 pm. This was a much better with far fewer people playing. My friend and I still had to wait for the group in front of us on most holes. The mini putt course itself is a haven of activity with lots of creativity gone into the course design. I can’t even explain some of the things you’ll see your golf ball do! The room is quite dark in the evening, and there were a couple of holes that freaked out the small kids (under 5) behind us a little bit. You’ll recognise some of the obstacles from around San Francisco and on one hole you don’t even need your putter. If you want, you can grab a beer from the bar for your match and if you choose you can head upstairs afterward for a sit-down meal. Need an Urban Putt coupon? Check the bottom of their homepage, and you should find a 2-for-1 coupon valid on Mondays and Tuesdays. Estimated time: 45 – 90 minutes (depending on how busy it is). And yes, it’s a family-friendly activity. If you know the name of this place, let me know! 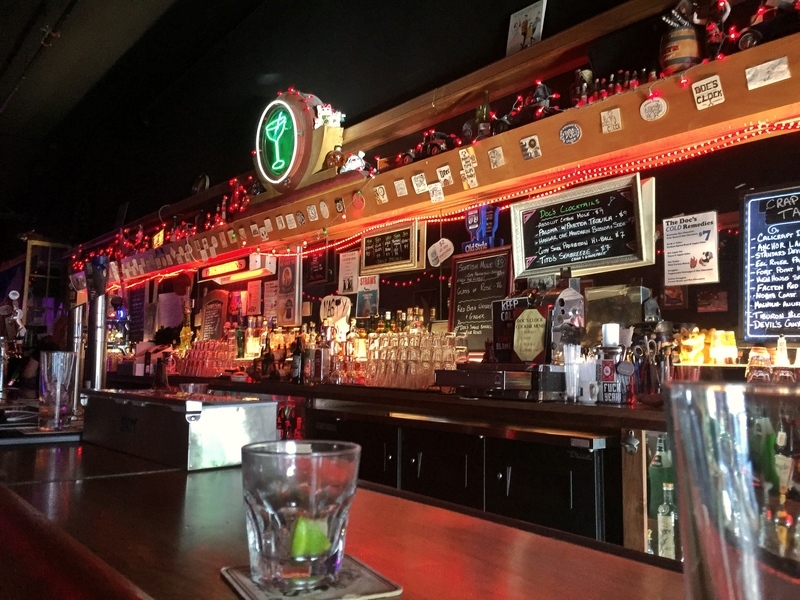 The charm of the Mission comes about partly because it feels different too the rest of San Francisco, they’ve avoided becoming overridden with chains, but have kept to small independent stores. Although the community is battling gentrification as talked about in the San Francisco Chronicle. 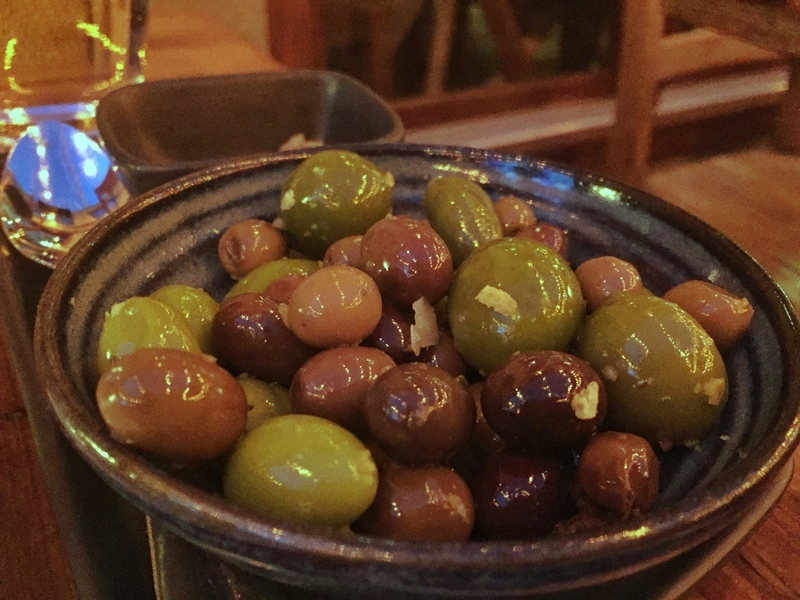 The nightlife scene has always bought people in from around the city with trendy new bars and old establishments continuing to please all tastes. I visited just the three spots, Doc’s Clock, Make Out Room (no, not everyone is making out like I suspected haha), and one place I can’t figure out the name too (it’s the one with the grafiti above. The unknown name one is my kind of bar, outdoor seating, chill vibes, and lots of beer selections. I’m no expert though, so take a read of this for more of an idea to find what you’re looking for. There aren’t many of the classic American drive-in movie theatres around these days. But at the Foreign Cinema you can sit down, have a nice, semi-expensive dinner and enjoy a movie. It’s not quite the same, but beggars can’t be choosers. Foreign Cinema opened in 1999 and has been recognised as one of San Francisco’s best restaurants 17 years in a row. The State Senator of California even proclaimed September 18th to be known as “Foreign Cinema Day”, a tribute to their service to the city. The Foreign Cinema menu changes on most nights yet the staff are well versed in what the dishes are. They are attentive, and while there were no vegan items on the menu, they let me know exactly what they could make vegan. overall, very accommodating. The food was solid, without being fantastic in my eyes (I had a soup and olive, vegan life yo), though my friend loved her duck. They’ve got a massive wine list with bottles sourced from around the world starting at ~$35 for a bottle in addition to a few ciders, beers, and cocktails. The movie being screened while we were there was Alice in Wonderland (the original). Honestly, I was slightly disappointed with the movie. In fairness, my expectations were way too high. If you’re thinking everyone stops chatting to watch the movie when it starts (at 8.30 pm), it’s not going to happen. The movie was on in the background on the large screen as you can see in the photos, but everyone more or less continues as it with the movie on a low volume in the background. they had the speaker kind of things you could put on your table, but sound barely came out of them. Either way, it was still a cool way to eat dinner as someone who hasn’t experienced that before. We didn’t book a table in advance and were put on the waitlist. We headed to a nearby bar for around 45 minutes (the expected wait time) before getting a text message that a table was ready for the two of us. If there’s a few of you, I’d recommend booking a table in advance. I can see why this place is popular. 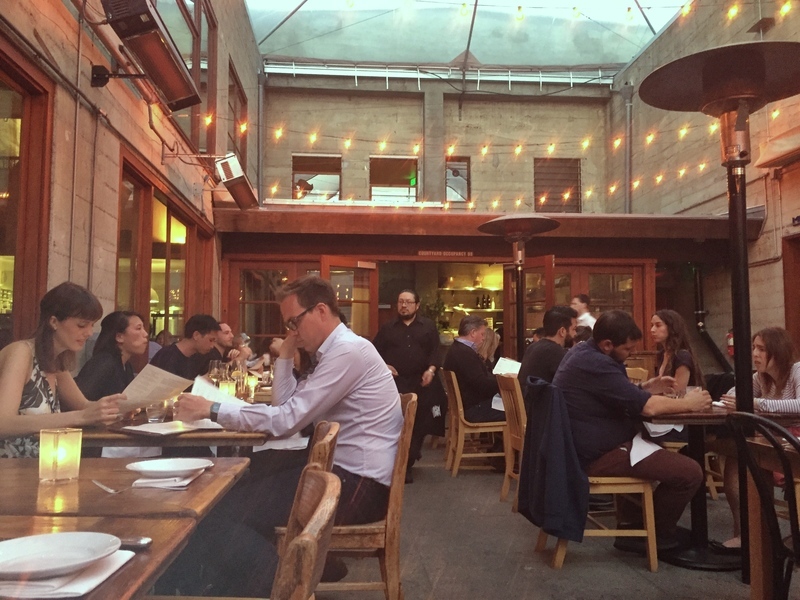 The menu changes, the customer service is great, the prices are within reason by San Francisco standards, and the atmosphere is choice. Now that I’ve been to experience the place I’d go back to celebrate something with friends but not for a random dinner out. Once is enough. 1. Dolores Park: Head here in the early afternoon, 1pm-ish sounds good for a picnic and people watching (maybe get some tacos from nearby). 2. 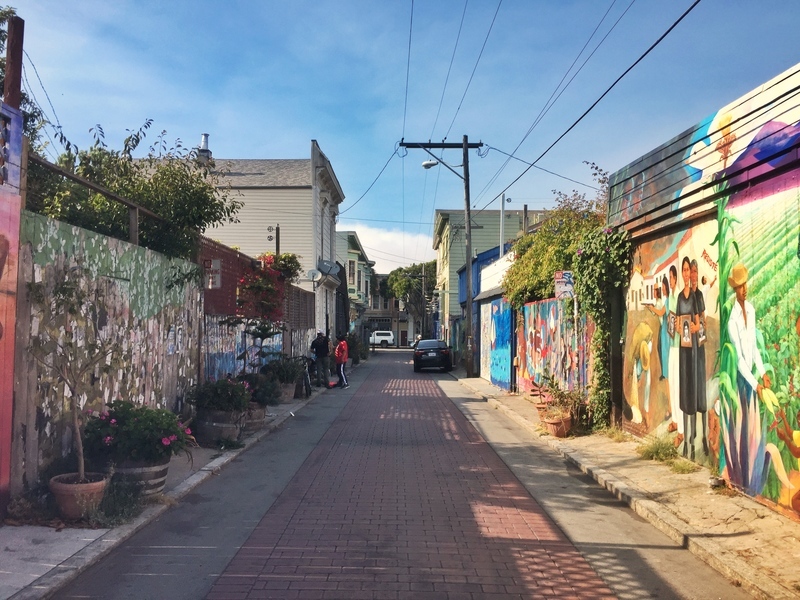 Balmy Alley & Exploring: Walk over to Balmy Alley before wandering with no plan through the streets and seeing what you come across. 5. Foreign Cinema: Time to finish up the night in style with dinner around 8 pmish. If you’re coming to the Mission on the weekend, Urban Putt opens at 11am so I’d make this your first port of call before the big crowds come in. Then head over to Dolores Park afterward (with tacos) and continue from there. I assume you’re coming from the Downtown/Financial/North Beach area. You could walk here, it’s anywhere from 2-4 miles depending on where you are. Otherwise the Muni is your best bet (you buy a ticket at the station). You’ll want to get off at 20th and Church for Dolores Park, which is in walking distance to Urban Putt if that’s your port of call. Once you’re in the Mission, everything is walkable. The weather! I was visiting San Francisco in the middle of summer and found myself heading to Goodwill to buy jeans on my first day. If it’s not as warm as you might expect in the middle of summer, in addition to all the fog, the Mission is known to be the hottest part of the city to locals. 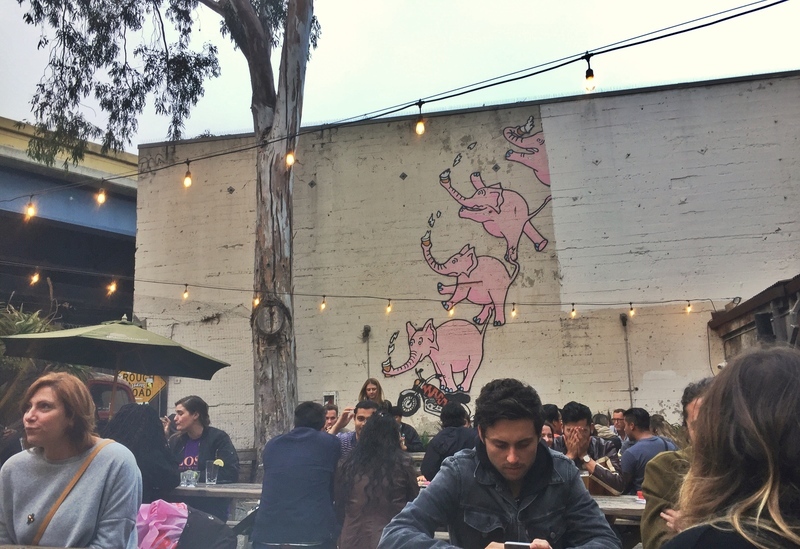 I hope you enjoy these things to do in Mission District as much as I did!